PVDFest brings in talent from all around the world and showcases it on stage with the brightest local stars. 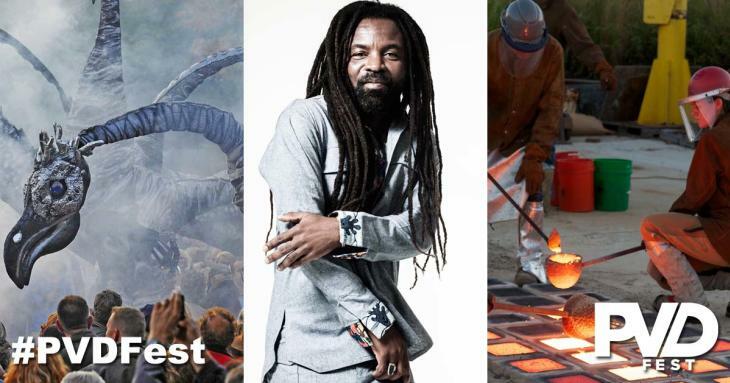 At this year’s festival you’ll see global stars of world music like Ghanaian reggae artist Rocky Dawuni, the legendary Afro-Cuban All Stars, and the red hot “Bhangra funk” of India-by-way-of-Brooklyn’s Red Baraat, alongside the Creative Capital’s own Malian master drummer Sidy Maiga, Latin music ensemble Salsa y Gaitas, and raucous street band What Cheer? Brigade. Local artists will turn Downtown into a veritable wonderland of creative placemaking and art installations. Providence Implantations will present an immersive pavilion and animated multimedia experience. The Steel Yard will use a 100-year-old coal forge to demonstrate blacksmithing. Overspray Studios will live paint a large-scale design inspired by the Creative Capital. And that just barely scratches the surface. The festival runs June 2-5, with events planned around the city for all four days (some of which are ticketed), but the big centerpiece of the whole weekend is on Saturday, June 4. That’s when PVDFest takes over Downtown for an all day and night celebration of everything that makes the Creative Capital America’s Coolest City. Oh, and did we mention the dinosaurs? John Taraborelli is a lifelong Rhode Islander and award-winning local writer on food, culture, politics and whatever else piques his interest. When he's not writing or working as a teacher and communications consultant, John enjoys running and drinking — both preferably on the beach, and not necessarily at the same time. He is also the co-organizer of PechaKucha Providence, a free monthly show-and-tell for grownups. He currently calls Edgewood home, and often needs to be reminded that it's actually part of Cranston.